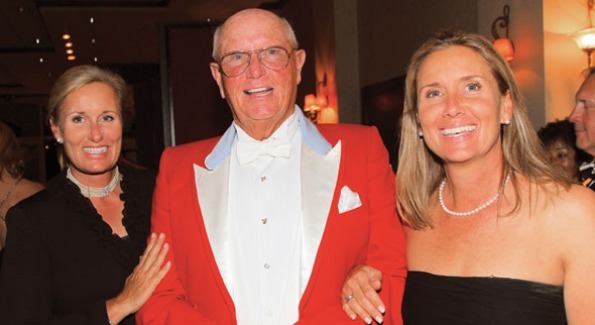 Emily Smith, Scott Traphagen and Patricia Luke at the Palm Beach Hounds Hunt Ball at the Albacoa Golf Club. The sun set on the southern social season for the horsey crowd at the Palm Beach Hounds Hunt Ball at the Abacoa Gold Club on Jupiter Island, Fla. Hosted by Robert Pelio and Scott Traphagen, joint masters of the group, dinner was followed by dancing with bagpipers from the Palm Beach Pipes and Drums adding a sporting touch. When he’s not out hunting on “America’s Most Wanted,” John Walsh cherishes the equestrian life. (He attended the ball with his wife, Reve Walsh.) International guests included Matt Nattago, Geraldine Donnelly and Pat Hayes from County Cork, Ireland and Anne Symes from New Zealand. Back in Middleburg, we know spring has arrived when hordes descend upon historic Buchanan Hall for the 48th Annual Daffodil Show, with multi-talented Barbara Sharp (also an artist) and Ginger Wallach serving as chairman and vice chairman, respectively. With 972 bulbs — the largest number of entries ever — there were competition categories for a large cupped, miniature and trumpet cultivars, a breathtaking display of every shade of yellow imaginable. The ever-horticulturally astute Linda Dodderidge won the coveted best-in-show for a formal linear design inspired by Monet‘s “Rouen Cathedral, Sunset.” Ann MacLeod, Kaye Nazarian and Pat Sharp Hyde also collected blue ribbons. The daffodil show also included a free-style hat design won by Patricia Hyde Sharpe, Diane Ingoe and Debra Author of the Upperville Garden Club but there were even more scintillating chapeaux at the Gold Cup races at Great Meadow. This year’s winners were: Debra Murphy, Ally Mihuc, and Susan Lowry. The afternoon included two victories for lady jockey Blair Waterman Wyatt, who won the big race on the Merriefield Farm’s Bon Caddo. There was also a tribute to the late Nick Arundel, Great Meadow‘s visionary founder. A week later, he was posthumously honored as Outstanding Virginian of the Year by Virginia’s General Assembly in a ceremony at the Northern Virginia 4-H Center in Front Royal. Lilla Ohrstrom threw open the doors of her Youngblood Art Studio in The Plains where she featured her own ceramics, jewelry and abstract paintings by Bill Couzens, and photo images from Megan Witt, Missy Janes, Jeanne Morency and Redmond Mannierre. Lilla’s husband, Chris Ohrstrom, and her father, Charley Matheson (with wife Julie Matheson) were spotted along with Sharon Maloney and Bill Higgins, Chip Maloney and Larry Fisher (who ventured out to the country from Chevy Chase). The evening included a presentation of the Annie Awards — in the form of a starfish designed by Lilla. This image has always been symbolic of the awards as a reflection of stars in the sky. “They represent healing, regeneration, vigilance,” said Bill Couzens, the major forced behind LessCancer.org, who also received a starfish. The awards are given out every year from Less Cancer in memory of Anne Couzens. The other recipients were Helen Wiley, Lysa Horkan, Greg Lam and Beth Grace. Finally, the countryside was aflutter after a long shot named Animal Kingdom broke past 19 other horses to win the Kentucky Derby. Trainer Graham Motion is somewhat of a local with family living in the area. Now everyone wants to adopt him. For anyone looking to buy a horse farm to train a future Derby winner, his brother Andrew Motion is a real estate agent in Middleburg with Thomas and Talbot. It’s a long shot, but the again so was Animal Kingdom.